CTD stands for “Conductivity, Temperature, and Depth.” It is one of the most basic tools for understanding the ocean. It’s a set of probes attached to a large metal wheel. About five times a day on our cruise, the instrument will be put over the side of the ship and lowered via a winch and cable to within about five meters of the seafloor. The CTD is also used to collect water samples at different depths. Most of the CTD casts on this cruise will be in about 100 meters of water and will take 20 minutes or so. In deeper water, say 3,000 meters, it could take 60 to 90 minutes for the instrument to go to the bottom and come back. 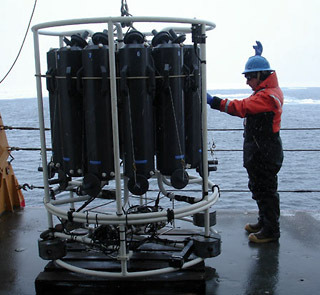 Scientists use the data recorded by the CTD to precisely chart where and how the temperature, salinity, and density of water varies in the ocean. This helps them understand the environment that marine organisms live in.